As an art student I was fascinated with the life and work of Vincent Van Gogh, and Starry Night in particular. 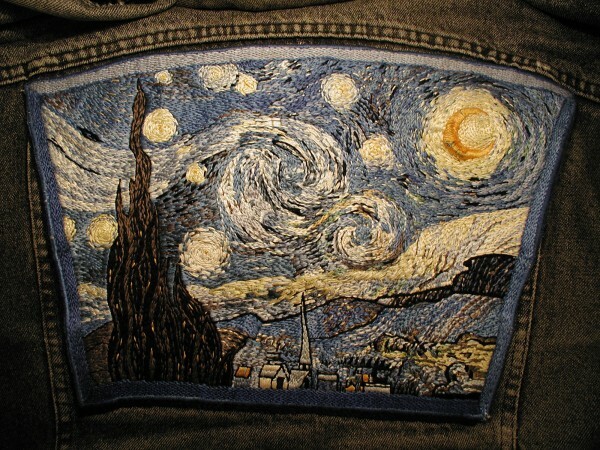 I often thought about recreating it in embroidery, inspired by the short, defined brushstrokes and strong colors that give Van Gogh's paintings so much energy. Finally, using a postcard for a guide, I made a grid to scale the image up to 9.5"x13" and transferred the rough guidelines in felt pen to the back of my husband's denim jacket. As I work, I am so focused on the tiny details that I feel like I am dissecting the painting brushstroke by brushstroke, exploring the mind of the artist as they worked on the original painting. By the end, I feel an emotional connection to the person behind the artwork, as if I were standing beside them, working my needle in unison with their brush. I did not keep track of the hours put into recreating Starry Night, but it was started in December 1987 and was finished in January 1989, so it took thirteen months to complete.